I had the pleasure of closing out a day of UX STRAT with this keynote talk about how context and strategy go together like peanut butter and chocolate. Delicious! Summer 2015 Update — Talks, Posts, and other things. 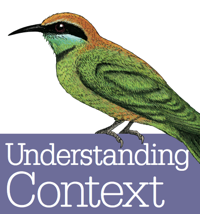 O’Reilly: Webcast for Understanding Context, presented on June 10. Luckily, with a quick registration, you can sign up to watch the whole thing for free! IA Summit:, where I co-facilitated a workshop on Practical Conceptual Modeling with my TUG colleagues Kaarin Hoff and Joe Elmendorf. (See the excellent post Kaarin created at TUG. summarizing choice bits of the workshop). SXSW Workshop: I taught an invited workshop at SXSW with my colleague Dan Klyn, on “Information Architecture Essentials” — which was wildly successful and well-reviewed. We’re happy to say we’ll be teaching versions of this workshop again this year, at IA Summit Italy, and WebVisions Chicago! UX Lisbon: where I taught a workshop on analyzing and modeling context for user experiences (which I also taught in abbreviated form at IA Summit, and which I’ll be reprising at UX Week later this summer). UX Podcast: While in Lisbon, I had the pleasure of doing a joint podcast interview jointly with Abby Covert, hosted by the nice folks at UX Podcast. As mentioned above, there are some upcoming happenings — I encourage you to sign up for any that aren’t already sold out! An updated version of a talk I presented at the Information Architecture Summit, for the very first Interact London conference. My TUG colleagues and I had a great time at UX Detroit, sharing this talk-version of a workshop we taught at IA Summit earlier in the year. Understanding Context — Some thoughts on writing the book. After several years of proposing, writing, revising, and production, Understanding Context is finally a real book. For obvious reasons, I’ve not been especially prolific here at Inkblurt, since every spare moment was mostly used to get the book done. And it’s still not really done … like the old saying goes, a work of writing is never finished, only abandoned. As I say in the Preface (now online), the book is definitely an act of understanding that is in progress. It’s an invitation to readers to come along on the journey and keep it moving in their own ways, from their own perspectives. I presented this talk at the IA Summit in San Diego this year, back in the spring. I’m adding it to inkblurt so it’ll have a home here, but I already wrote about it over at TUG a few months ago. The general contention of the talk: as planners and makers of digital things and places that are increasingly woven into the fabric of the world around us, we have to expand our focus to understanding the whole environment that people inhabit, not just specific devices and interfaces. Rather than trying to define information in just one way, I picked three major ways in which information affects our world, and the characteristics behind each of those modes. Ultimately, I’m trying to create some foundations for maturing how we understand our work, and how it is more about environments than objects (though objects are certainly critical in the context of the whole).